Last weekend, “Holy Smoked,” a new documentary about kosher Brooklyn BBQ joint Izzy’s Smokehouse, debuted at the Food Film Festival in Manhattan. The film explores the journey (and challenges) of Sruli “Izzy” Eidelman and what inspired him to follow his dreams of opening a kosher BBQ restaurant in Brooklyn. I’m happy to exclusively announce that this great documentary is now available online for anyone to view it. Watch Holy Smoked here. “Holy Smoked” premiered alongside five other short films about barbecue at the Food Film Festival, and Eidelman served his incredible pastrami brisket at the event. “Holy Smoked” is directed and edited by Jeff Jones, a multimedia producer based in Brooklyn. The film is his follow-up to “For The Love Of Meat,” a documentary about Texas BBQ masters like Aaron Franklin, Tootsie Tomanetz, and Wayne Mueller. 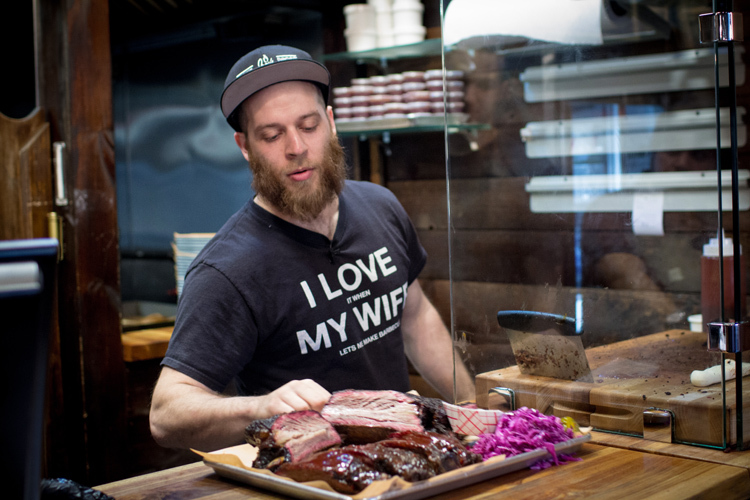 Eidelman and Jones met at a January 2017 screening for “For The Love Of Meat.” Their meeting eventually led to Jones wanting to follow Eidelman and his uphill climb to make kosher BBQ a known quantity in Brooklyn. "Holy Smoked" shows Eidelman’s win at Brisket King 2017 and many other moments that have elevated him and his restaurant. If you make it to Izzy’s Smokehouse in Brooklyn, make sure to try the brisket and pastrami. Izzy’s Smokehouse has seen a lot of success despite having just 20 seats, and the restaurant is almost always booming, whether it’s for lunch or dinner. So what’s next for Eidelman? He says he plans to open a larger restaurant sometime in 2019 and that it will have a more expansive menu. I’m already hungry for 2019. The anticipated fall openings of Hometown Tavern and Hometown Deli have been postponed until January, Hometown confirmed to NYC BBQearlier this week. Tavern will serve fried chicken, burgers, and more and be located a few blocks north of Hometown Bar-B-Que in Red Hook, while Deli will be serve high-quality sandwiches and be located in Industry City, Brooklyn. Mexicue, a New York chain that cleverly blends Mexican cuisine and Southern barbecue, just debuted a new Upper East Side location. Mexicue started as a food truck in 2010, but has since gone on open four physical locations in Manhattan. Eater New York recently published a thorough list of the 21 best Jewish delis in New York, where you can eat outstanding pastrami, smoked chicken, all-beef hot dogs, gravy fries, and other items. November 2: Starting tonight through December 21, a new Smorgasburg x VICE Night Market is opening in Williamsburg, Brooklyn. The market will have live music, stuff for sale, and 10 awesome food vendors including Carnal (who will be selling short rib burgers cooked in bone marrow fat, slow-cooked pork belly, and more), Sons of Thunder (who sells amazing modern hot dogs and poke), and more. Buy tickets / RSVP for free here. November 2 & 3: The groundbreaking Food Loves Tech event, now in its third year, takes place this weekend in Industry City, Brooklyn. General admission tickets run $75, and it will show off how technology shapes and changes the way we cultivate and consume food. Food Loves Tech combines installations, tastings, panels, and dining experiences to explore and celebrate the future of food. Buy tickets here. November 3: This Saturday, the Moll's Dolls National Kidney Foundation Fundraiser will be held at Brother Jimmy's BBQ. You can support the NKF by joining the Molls Dolls at Brother Jimmy's from 2 to 4 p.m. For $60, you’ll get two hours of open bar and BBQ, and you’ll raise money for a great cause. Buy tickets here.